Plaques are a great way to preserve memories forever. From photographs to awards and newspaper articles, almost anything can be preserved into a plaque. While most plaques can be made by using a wooden base sealed with heat, we also have another option that is just as stylish and professional: acrylic plaques. Acrylic plaques bring a new kind of aesthetic dimension to your wall or workspace, and they can add depth to logos. You can order your own acrylic plaque today that displays the logo of your company or any other design. But how is acrylic made? What exactly can an acrylic plaque be used for? Our acrylic plaques are produced through a delicate process of image application, which flawlessly and vibrantly displays your images and text with no toll on picture quality or legibility. Contrary to traditional glass mounting and plexiglass plaques, our acrylic mounting process delivers superior stability and quality, eliminating blemishes and withering that develop over time. This process, responsible for the exceptional quality and time-tested durability of our acrylic products, begins with a pre-molded, translucent ¼” slate of acrylic and thin vinyl sheet. The first step in creating our high quality acrylic plaques is the printing and application of content and images to the vinyl sheet. Images, text and pages selected by our customers are reverse-printed onto vinyl pieces, which are then firmly applied to the acrylic slate through a combination of water application and pressurized treatment. It is useful to imagine the process as similar to the technique cars have images ‘wrapped’ onto their exterior. Following the image application, each completed slate of acrylic is cut to a customized size with a diamond-tipped edging tool. Custom mounting hardware is then fixed to the acrylic model, and can be put on full, attention-grabbing display in your business, home or office. An acrylic sign is not only great for preserving your memories, but also preserving the aesthetics of your company. Well designed company logos can add a multitude of business to your company, and an acrylic sign can make your logo look detailed and professionally designed. Customers and clients alike will be more attracted to a logo displayed with an acrylic sign than a logo that is simply listed among others. We also specialize in plaques, custom wall displays, and mouse pads. Our plaques are designed with your personalization in mind, so you choose the type of wood for your base, the trim, the engravings, and the layout of the display. Our plaques are great for preserving special memories, occasions, and accomplishments. 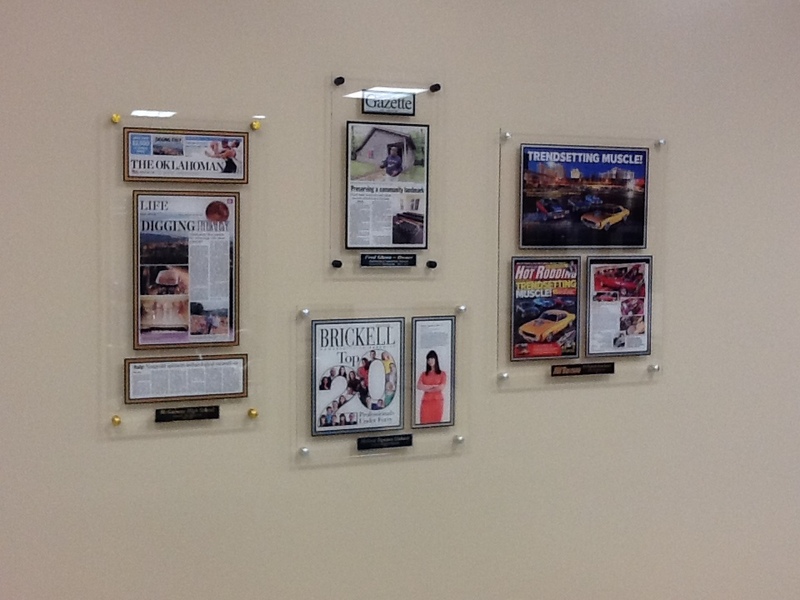 When in the need for more than one plaque, you can personalize and create your very own custom wall display. Custom wall displays are a great way to display all of your accomplishments, memories, or even the accomplishments of your employees. Our mouse pads are designed with your logo in mind; all we need is the design and other brief information and we can make it for you. Mouse pads are a great asset to any workspace or work computers. You can display your logo proudly and professionally. Between everything we have to offer, you can find anything you need with us! We are here for any event and every single one of your accomplishments! Our plaques are all hand crafted with precision and style for your personalized and professional design. Since you design practically every aspect of your plaque, every plaque is unique to its recipient. Your one of a kind plaque can portray any newspaper article, magazine clipping, information on an essay you wrote, or any accomplishment. For more information on any of our plaques, acrylics, or mouse pads, contact us today, and we can make your wall or workplace look stylish and professional with your achievements.